Coffin basin elements on Plexiglas frame. Dennis C. Forbes, editor of KMT, has had better luck than other KV 55 detectives in tracking down some of KV 55's missing treasures. For Forbes, the trail began sometime in 1999 when readers of KMT wrote to the journal about reports circulating on the internet concerning the basin of the KV 55 coffin. Actually a misnomer, the so-called "basin" referred to on the internet is in fact a collection of glass and semi-precious stone inlays which once decorated the wooden basin of the coffin. These, along with the thick gold foil cloisonné framework in which they were set in a rishi pattern and in a band of inscriptions running along the rim of the coffin, constitute parts of what is left of the basin since the wood on which they were placed has completely disintegrated. The basin elements had been shipped by Davis to the Cairo Museum along with the rest of the coffin and other KV 55 antiquities, and Gaston Maspero reported in his 1915 Guide du Visiteur au Musee du Caire (Cairo,1915. p. 407) that the coffin lid was being restored (by M. Reseigno and Carlo Oropesa, who were completing the job begun by Daressy three years earlier. See Martha Bell in JARCE 27 , 99, n. 10, 12.) Whether plans were made to restore the basin at this time is currently not known to me, but, since the lid was finished in 1915, Maspero's comment that Oropesa's restoration work was still "in progress" is interesting, and may indicate that an attempt was slated to restore the basin. By 1931, when Rex Englbach conducted a detailed study of the coffin (see ASAE 31 , 98ff. ), some of the basin elements could not be found. Subsequent searches through the Cairo Museum failed to discover them, and they were eventually classified as missing or stolen, whereabouts unknown. The 1999 internet rumors claimed that the coffin "basin" had finally been located, allegedly in a European Museum. Forbes (in KMT [10: 3], 2, 18-19) confirmed these reports, and published color photos of the basin elements, which have been reconstructed on a coffin-shaped plexiglass base. They are now in the collection of the State Museum of Egyptian Art in Munich, Germany. The details of how they got there remain a mystery to the general public. Museum spokesperson Dr. Sylvia Schoske, in a statement on the BBC given on July 13'th, 1999, speculated that the coffin elements had probably been taken from the Cairo Museum sometime immediately after WW I. In his KMT article, Forbes states that they had "ultimately [been] acquired by a collector" prior to coming into the possession of Munich's Museum of Egyptian Art under circumstances that are still not fully understood. (See "The KV 55 Coffin Basin Online" below for more about how the coffin basin elements were acquired.) Forbes also stated that "several noted Egyptologists" had unofficially claimed to have seen the coffin elements, or photos of them, and reported that the cartouche of Smenkhkare appears on a band of hieroglyphs running down the interior bottom of the restored basin. 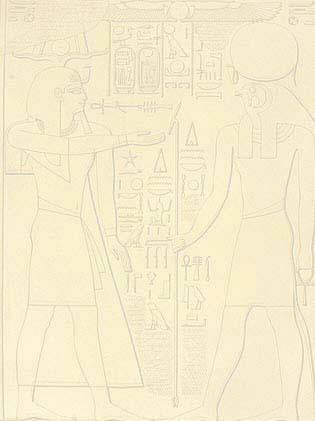 Forbes also reported, however, that Dr. Schoske denied the existence of this cartouche but maintained that some of the titles appearing in the existing inscriptions "would surprise many Egyptologists." During a recent visit to the Cairo Museum, Forbes himself had a pleasant surprise (which he describes in KMT [12: 1], 2-3.) The museum's director-general emeritus, Dr. Mohamed Saleh, showed him a Temporary Register in which appears an entry mentioning some of the coffin basin elements. Dated December 2, 1915, the unsigned entry stated that the wood of the coffin basin was "too rotten to keep," and went on to explain that the remaining elements (described as a "gold network and stone and glass...mosaic" in the entry) had been stored in two boxes in a room behind Maspero's office. (See also Geoffrey Martin in BdE 97 , 119, n. 52, and Martha R. Bell in JARCE 27 , 99, n. 11, where this Temporary Registry entry is also noted.) The entry proves that these basin elements were in the Cairo Museum at least until early December, 1915. There is, however, reason to believe that the time-frame for the disappearance of the Temporary Registry objects described and dated December 2, 1915, can be narrowed considerably further. A fascinating tale involving the movements of KV 55 objects within the Cairo Museum may be gleaned from the footnotes to Martha Bell's JARCE 27 paper (referred to above and elsewhere on this page). Bell refers (in JARCE 27 , 99, n. 11) to a Temporary Registry entry numbered 2/12/15/2 (read "2'nd December, 1915, object lot 2) which is the same entry Saleh showed to Dennis Forbes. The contents of this entry have been briefly noted in the paragraph above, and very probably describe some of the basin elements now in Munich. Bell states (again in footnote 11, p. 99 of her paper) that the objects designated Temp. Reg. # 2/12/15/2 were eventually combined with other KV 55 objects that had been given the Temporary Registry number 5/11/27/16. These two lots of objects, now combined, were then assigned the coffin lid's entry number JdE 39627. Bell indicates that JdE 39627 was appended with a Special Registry number in the 1960's (SR 7784), and described at that time as "Gold plate from sarcophagus of Smenkh-Ka-Re. Some inscribed and some with glass inlay"; "Gold plate"; "Weight 920 grams." (Her use of separate quotation marks may indicate that each notation had been written in a different hand, perhaps because three different people had examined the objects, each adding something to the description.) These objects must have been the ones originally designated by Temp. Reg. # 5/11/27/16, the ones combined with Temp. Reg. # 2/12/15/2 and then added to JdE 39627. If Temp. Reg. # 2/12/15/2 represents the objects now in Munich (and Dennis Forbes implies that he thinks it does--see KMT [12: 1], 3, para. 1), then these particular objects could not have left the Cairo Museum earlier than the Temporary Registry date given to the objects with which they were combined: 5/11/27/16, which is read 5'th November, 1927, object lot 16. This is only four years before coffin basin elements were discovered missing by Engelbach. the coffin basin taken by T. R. M. P. Associate Researcher Nicholas Christodoulides. Forbes goes on to report that Saleh next showed him photographs of rectangular sheets of gold foil and explained that these were additional elements from the coffin basin. The exact nature and location of all the gold sheets found with the KV 55 mummy have been a matter of conjecture for years. Gold sheets were described at the time of the tomb's discovery as though they were part of the mummy's wrappings. According to Davis, the mummy, from hands to feet, "was covered with pure gold sheets, called gold foil, but nearly all so thick that when taken in the hands, they would stand alone without bending. These sheets covered the body from side to side." (ToQT, 2.) Ayrton described the mummy as being "wrapped in flexible gold plates," (ToQT, 9), and Maspero mentions "the sheets of gold in which the mummy was wrapped." (ToQT, XIII. See also NL, 294.) Weigall (GP, 137) and J. L. Smith also mention the gold sheets, and Smith adds the detail that there were a dozen of them, (TTAA, 63). Mummy expert Bob Brier speculates that these sheets might have been placed around the mummy as a kind of ritual preservative (BB, 122.) However, Daressy does not include them in the part of his catalogue devoted to ornaments found on the mummy (or anywhere else in his catalogue of KV 55 objects per se) and it might be the case that the gold sheets mentioned in the early accounts were parts of the gold foil that decorated the inside of the coffin (this, in fact, was Daressy's opinion in 1916. See BIFAO 12 , 149 and n. 1. J. L. Smith, TTAA, 63, and Reeves, DRN, 46, no. 20 also believe the gold foil sheets came from the coffin lining). The foil decorating the inside of the coffin lid could have fallen onto the mummy when the ceiling section dropped onto the lid, breaking it into three sections, and forcibly separating the gold foil from the wood in the process. However, Daressy had described the interior of the coffin in 1910, saying, "The interior of the coffin was was also covered with gold leaf" and even describes the band of inscriptions running along the inside of the coffin's lid and bottom, which he explains as having been carved in wood with the gold foil subsequently "pressed down over it to receive the imprint." (ToQT, 19, no. 4.) This initially sounds as though the gold foil lining the coffin lid was intact. But Darresy's wording is ambiguous: "was also covered with gold leaf" could mean that the inside of the coffin had been gilded when made and not that the gilding was still intact when the coffin was found. His explanation that the gold foil had been pressed down onto the carved hieroglyphs by the coffin's makers also does not necessarily entail that it was still impressed onto them when discovered. Whatever their original purpose, C. N. Reeves had reported in 1990 that gold sheets from KV 55 were still in the Cairo Museum, forming part of a group of objects catalogued as JdE 39627 (DRN, 57, n. 146), the same collection of objects that had once contained Temp. Reg. # 2/12/15/2. This report, as Dennis Forbes unexpectedly found out, was completely accurate. After showing Forbes the photographs, Saleh escorted him (and his friends Dr. Barbara Mertz and Joel Cole) into a museum laboratory where chief conservator Samir Abaza produced gold sheets from KV 55. Forbes describes seeing a stack of these objects, each approximately 12 x 18 inches to 6 x 8 inches in size, with ragged edges, each one "very crisscrossed with a grid of wrinkles clearly caused by having been folded repeatedly into what would have been a palm-sized packet." (KMT [12: 1], 3.) In an email, Forbes further described the sheets to me as having "a thickness and flexibility similar to aluminum cooking foil." The sheets were laid flat on brown paper, and, as Saleh and Abaza revealed them one at a time, Forbes noted that most had been inscribed. He also reported that a cartouche had been excised on one of them. Forbes could not examine the inscriptions in detail at that moment due to time constraints, so he could make no comments on their content other than noting that it will be difficult to read them due to the many creases produced by the folding of the gold sheets. It appears from the published evidence available to me now that this folding was not the work of any Egyptologist helping to clear KV 55 back in 1907. The sheets sound as though they had been wadded up by someone who wanted them to be easily--and clandestinely--transported out of the tomb, perhaps for sale on the antiquities market. However, Forbes reminded me that KV 55 had been hastily cleared, and his KMT "Editor's Report" allows for the possibility that the sheets had been folded (and, unfortunately, badly creased) by the "professionals" who officially removed the tomb's objects for shipment to Cairo. If these sheets were among the items stolen from KV 55, then exactly how they came into the possession of the Cairo Museum would be, like so many other aspects of KV 55, a mystery.